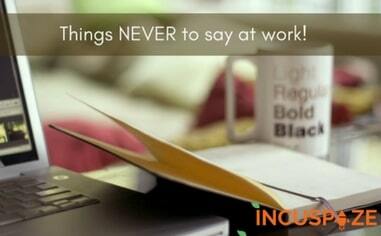 4 Things NEVER to say at work! Nobody likes having a crude, insensitive, rude or critical co-worker in their office space, but we all have one of those days where we aren’t ourselves. Maybe it is a disagreement in a particular situation, maybe it is a slight slip of tongue, maybe it is the feel of being overwhelmed or you’re just stressed out, there are numerous scenarios where you may have your foot in the mouth. Incuspaze is an abode to 30+ startups, all with different team strengths, backgrounds, concepts and work methodology. Granted that there are numerous advantages of having a co-working space for your startup there are times, you might intend to suggest a constructive feedback that ends up being rude. There’s no need to hide what you want to say, honesty has always been the best policy but there’s always a polite, honest and effective way of doing that, and there are certain phrases that you should NEVER ever say. This write-up focuses on the things you should NEVER say at work. Once you say this phrase, or someone mistakes this to be your intent, you become a self-serving narcissus. Yes, when you’re preoccupied, it is easier to dismiss things which are just “not your problem”, but the better way would be to recommend someone else who could deal with the situation. That way, people will view you as a team player. You would never want to change what’s already good, but looking stiff, obstinate and inflexible isn’t something you’d want to be known as. Whenever a situation demands you to alter your way, be perceptive and open to the idea of the change. Try to know WHY would it be better! That makes you a perceptive and flexible coworker. Maybe you’ve run out of options and there’s really NOTHING you can do about it, but nobody wants to be turned down and that kind of rejection makes you look cruel. A pessimistic attitude hampers your way and can breed unnecessary negativity in the office space. Rather focus on discovering more possibilities and ask others to come up with more options. That’s as painful as it gets. Many-a-times this phrase comes out of nowhere and before we realize, we would have said it. Instead, say “I disagree because…what do you think.” Even if you’re right, always soften the blow. Apologize: Be sincere about any upset or confusion you’ve caused. Say what you actually meant: Admit, accept, clarify and resolve. Incuspaze is committed to create a productive and startup-friendly co-working space. Our centre heads ensure a productive environment and in line with the true spirit of entrepreneurship and progress, build a global self-sustainable ecosystem for startups and entrepreneurs. Gif Source: tumblr, reactiongifs, imgur.